Looking for workbench plans together with workbench kits and building your own workbench or just buying a good solid woodworking bench. The decision most often leads to getting workbench plans and doing it on your own. Building a workbench according to a plan leaves enough room for personal adaptation according to individual needs. So whether it is changing the height or the size of the final workbench or simply adding additional vises, if you follow one of the better workbench plans, you will be able to adapt the bench totally to your wishes. From your woodworking supplier or over the internet you can get workbench plans alone or combined with kits. These kits provide the basic hardware such as vises and clamps. This saves a lot of time and lets you focus only on getting the wooden parts. A good example are Rockler's workbench plans combined with its hardware kit. You can either get the plan alone or purchase the workbench kit as well. The plan comes from issue no. 25 of Today's Woodworker and leads to a workbench which is 30'' wide and 80'' long. What is interesting about this plan is that Rockler incorporates its T Slot system into the workbench. This T slot system allows you to fix additional holders and clamps to the workbench. One of these T slot clamps is the Hold Down T-Slot Kit which gives you an extra hand while working on the workbench table. It is the same clamping system used on Rockler router tables. 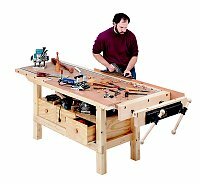 Northerntools offers 2x4 Basics AnySize™ Workbench Kit where you just build a 36 inch high workbench according to the workbench plans. You need to get and cut the lumber parts, which are not included, and cut them according to the plan. This workbench is a very inexpensive alternative for anybody who is not looking for woodworking workbench plans but for a decent Garage workbench kit. The rust– and solvent–resistant resin legs give the workbench the stability needed. The workbench holds up to 1000 lbs. per shelf. Within the kit are 2 Finley multi–position work holders and a detailed set workbench plans to assemble properly. The lumber is not included, which allows you to cut the workbench according to your needs. To sum it up, whatever workbench plans you get, whether it is for woodworking benches or for simple garage auxiliary benches, make sure they include a detailed parts list. If you can get them together with workbench kits, then it might be worse buying it, as you will save time and money sourcing all parts like vises and clamps. Also, check with your local woodworking shop and search the web for the woodworking workbench plans you like.